Fans were excited about the prospect of a Team Liquid upset on home soil after the squad’s triumphant run leading up to the ESL One New York grand finals, but Europe’s FaZe Clan had other plans. For a game dominated so consistently by teams abroad, seeing Team Liquid rally to win the $250,000 prize pool event at Barclays would have been a special moment for North American CS:GO spectators. Chants of “USA” had greeted Liquid and continental colleagues Cloud9 throughout the tournament and the momentum seemed to favor both squads coming out of the group stage. Only Liquid advanced to the final best-of-five series, however, where they proceeded to convincingly lose three straight matches at the hands of FaZe. It was clear from the start that whatever magic had enveloped the team during the group stage and semifinals had worn off as Liquid failed to find their footing round after round on the first map, Inferno. At 0-12, Liquid looked like they might finally take a point off FaZe after gaining a 3 vs. 2 advantage. Nikola “NiKo” Kovač wouldn’t allow it though. In the span of a few seconds, the young Bosnian dismantled Liquid as if doing warm-ups prior to a casual online streaming session. From there, Liquid continued to deflate, eventually conceding the first half without ever getting on the board. Fans tried to muster some enthusiasm and energy for the Twitch cameras, but the shock and confusion was evident. Coming off a perfect 15-0 lead, some might have expected FaZe to start acting a little overconfident after swapping sides. And Liquid did manage to draw blood out of the gate. Their opponents immediately rallied though, and in rapid succession FaZe delivered another clinical 15-3 finish. The first half of Overpass was little different with Liquid struggling to build on an early lead and going on to lose it 11-4. It wasn’t until the second half that the North American squad looked posed to mount an unlikely comeback. As if suddenly injected with the quality and coordination that had delivered them 2-1 from a tough semifinal against SK Gaming, Liquid put off match point to 15-10 where they managed to stall a few rounds further. at 15-14, however, Liquid stumbled into FaZe’s sights. Staring into a cloud of smoke, the team started to melt as NiKo shredded them one by one. On the third and final map, Mirage, things ultimately played out much like the first one. Liquid failed to find any openings in the Europeans’ defenses and FaZe made sure not to rush and expose themselves. Clutch plays by the latter left the former high and dry going into the later rounds, with barely any money in the bank with which to try and buy a way out from the repeated beatings. In addition to being out-maneuvered, Liquid also failed in another respect: they didn’t have a NiKo. Going into the grand finals, FaZe won every round where he got the first kill, and racked up kills within the best-of-five series at such a rate that Liquid could have been forgiven feeling outnumbered during most engagements. Whatever the future fortunes of either team, it’s clear NiKo, only 20 years old, came out of ESL One New York looking like one of the top CS:GO players of 2017. 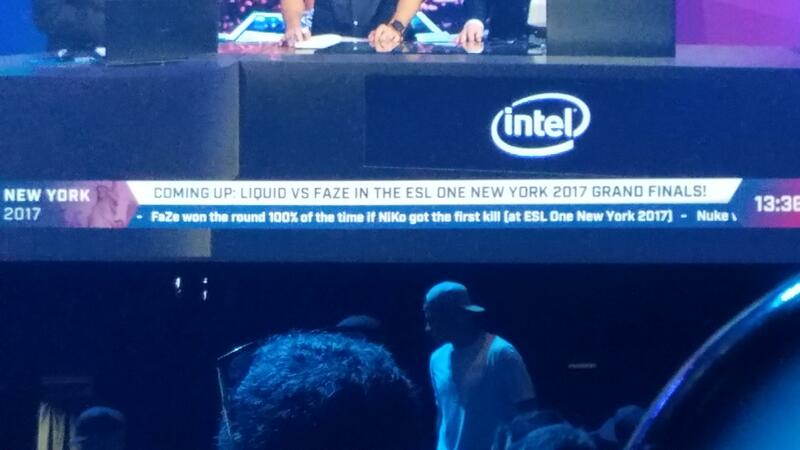 You can re-watch the entire grand finals here.